This page contains the software, firmware and driver files for ILT's light measurement products. These files are also located on their respective meter pages. PLEASE NOTE: Our DataLight software has been tested on both Home and Pro Versions of Windows operating systems, as well as MAC OS X environments where applicable. Other software below has been validated on a PC using Pro Versions of Windows software, and not within home level versions or MAC environments. Please refer to the equipment's specification page to confirm which version of operating system your equipment/ILT software revision is compatible with. 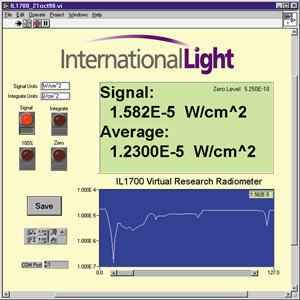 If you experience any difficulty with your instrumentation or software, please email ilsales@intl-lighttech.com for assistance. MD5 and SHA1 checksum values are used to verify the data integrity of a downloaded file by comparing it to the checksum value of the original file. Linux/UNIX and Mac devices have this capability built-in; for Windows, several free utilities are available on the web to help you determine the checksum value of your downloaded files. DataLight III MAC OS X software is compatible with ILT’s latest models including ILT1000 Low Profile Datalogger, ILT5000 Research Radiometer, ILT6000 Rack Mount Multi-Channel Meter and our NEW ILT2400 Hand Held light meter with touch screen display. The new and improved DataLight II software is compatible with ILT’s latest models including ILT1000 Low Profile Datalogger, ILT5000 Research Radiometer, ILT6000 Rack Mount Multi Channel Meter and our NEW ILT2400 Hand Held light meter with touch screen display. DataLight II includes ILTs “Meter”app designed to maintain the look and feel of the Industry Standard ILT1700 Research Radiometer and our improved Flash Application version for measurement of flashes as brief as 20 µsec (i.e. with a 200 µsec flash you receive 10 samples/flash.). Also included are Trend, Bar, Datalog, CLI, NetConfig and FW Update. LabView Virtual Instrument Drivers to be used with the ILT1000/ILT5000 API. See Command and Control Manual for configuration. DataLight is the original version of ILT1000 software designed to run on XP. Before using DataLight, new customers will need to do a firmware change to assure compatibility. Both the DataLight software and DataLight Firmware are located in the supplied zip file. DataLight includes Trend, Bar, Datalog, and CLI (CLI will run also run on MAC). DataLight does not include the “Meter” app and is not compatible with ILT5000 units. maximum flexibility and functionality available without sacrificing ease of use. We offer free downloads of Virtual Instrument drivers for use with LabVIEW. The LabVIEW program itself is available from National Instruments Corporation. We also offer a compiled executable version of our Virtual Instrument, which bundles a limited (non-editable) version of LabVIEW for customers who do not wish to purchase a copy of the program. This VI executable displays incoming data in real time and allows the user to save data to a text file for importation into a spreadsheet program. To get the VI drivers or the VI executable, click on one of the links below. If you own a copy of LabVIEW, you will need the files "Virtual_Radiometer_20apr99.vi" and the library "Virtual_Radiometer_20apr99.llb" which includes all sub-vi's and diagrams so that you can customize the program within LabVIEW, running on any platform. If you do not own a copy of LabVIEW, you will run the file called "Virtual_Radiometer_20apr99.EXE" (note: you must have the file called "serpdrv" in the same folder.) This compiled run-time executable program includes a limited version of LabVIEW, and is only available for Windows 95 / 98 / NT4. NOTE BEFORE DOWNLOADING: International Light Technologies has not tested or modified this file. It is being supplied as a courtesy to our customers. Please use at your own risk. Download the Labview 7 Compatible Source files (.zip format) New!